12/12/2016. 1035. The ILB crew were asked to launch by the UK coastguard at Holyhead to investigate a small dinghy about 1.5 miles out from Splash Point, Rhyl, which was drifting into the busy shipping lanes at the entrance to Mostyn channel. The Crew found it to be a small tender which had broken adrift and the harbour master was aware in Rhyl. The dinghy was towed back to Rhyl harbour and safely secured, the ILB returning to station at 1115. 7/11/2016. 1400. 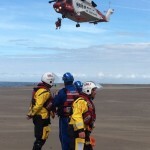 Rhyl, Llandudno and Flint coastguard teams were paged by UK coastguard to assist with a male who had been found in the sea and had been brought ashore by members of the public near the Beachside café about 100 metres from the boathouse. The coxswain and crew offered their assistance as only Rhyl coastguard were on scene quickly, so the lifeboat crew drove to the café with casualty care kit and oxygen. The crew administered casualty care until Flint and Llandudno coastguard teams arrived, together with an ambulance. Once the man was handed over to the ambulance team, the lifeboat crew left at 1438. Classed as a shore-based incident. 21/10/2016.2300. The ILB crew were paged for immediate launch to search for a missing person off the Pavilion Theatre Rhyl, thought to be in the water. As the crew were going down the beach, police reported the person now ashore and safe, so the ILB crew were stood down, returning to station at 2324. 30/9/2016.1910. The crew were gathering for their Tuesday night training session when one crew spotted 7 adults and 5 children stuck on the large sandbank off the boathouse. The men were wading through, but the women were very hesitant as the men were up to their waists in water with a fast-incoming tide. The crew were on scene with the ILB in 4 minutes, and were able to assist the party by taking the children back to shore, whilst the adults kept on wading back. Once all the party were ashore, they were met by local coastguards who gave them strong safety advice. the ILB crew returned to station at 1925. 27/8/2016. 2026. Both boats were launched, and the local coastguard team alerted, after Holyhead Coastguard received 999 calls regarding a person swimming out to sea off Barkby beach, Prestatyn. The person was reported as being nearly a mile out. 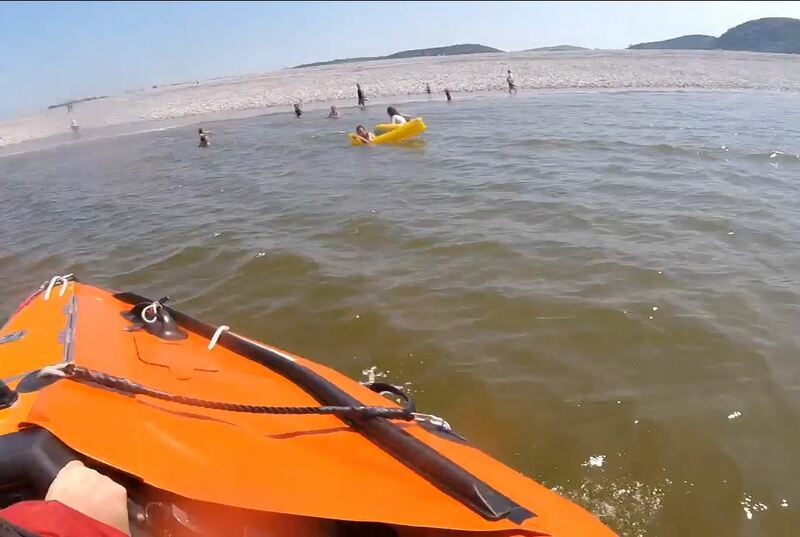 The ILB launched first, followed by the AWB some 10 minutes later. The ILB arrived on scene and began a search up to 1 mile out off the beach. The crew spotted the person in the water and came across a man who was clothed in proper distance-swimming gear and cap and goggles, happily swimming nearly a quarter of a mile out. 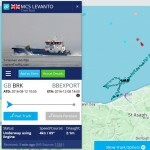 It was very lucky that the crew spotted him, as he was in the shipping lanes used by the fast windfarm transfer vessels. He was asked to return to shore, as it was dark and he was not very easily seen in his apparel. Once ashore, the coastguards had a safety word with the man, who was a German and happily swimming. He was asked if he went in again to notify the coastguard of his intentions. 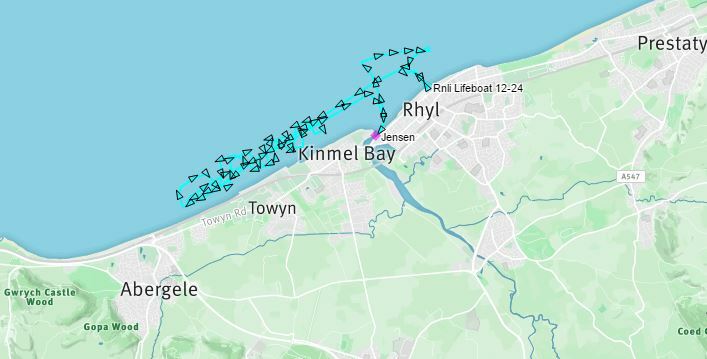 As all was well, the boats returned to Rhyl at 2120. 26/8/2016. 1452 The crews of both boats had just finished filming with both ITV Wales news and BBC Wales news, when Holyhead Coastguard asked for an immediate launch of both boats to 3 people in difficulty off the Nova Centre, Prestatyn. 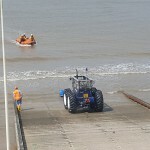 The RNLI lifeguards were affecting a rescue but required assistance. The ILB was launched and was on it’s way when Holyhead Coastguard reported the lifeguards had successfully recovered the people and all was well. The ILB returned to station at 1505. The AWB was also stood down at 1500. ……………………1648. Holyhead coastguard requested ILB to launch after the crew saw a kite surfer struggling to get his kite airborne some 200 metres off the Sun Centre. The ILB launched and got alongside the person just as they were able to stand up in the shallows. The crew then escorted the person to the shore until they were safe. Local coastguards were also alerted to attend. The ILB returned at 1655. 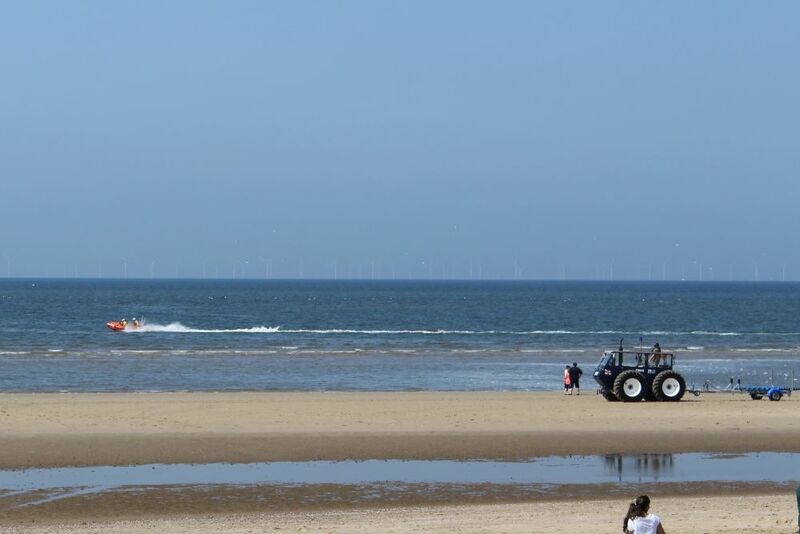 …………………….1658 The ILB was requested to re-launch to assist Prestatyn RNLI lifeguards rescue 2 children struggling in the water off Ffrith beach Prestatyn. 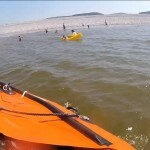 The ILB was about half a mile from scene when the lifeguards reported all were safely ashore. The ILB returned to station at 1710. 23/8/2016. 1905. The ILB crew were paged to search the shoreline west of Rhyl for a person in a small craft apparently waving their arms. The ILB launched and searched the area. There was no-one around apart from a small group with an inflatable ring and a spade in the area. This group denied being in the water, and after another short search, the ILB was stood down at 2000. 21/8/2016. 1423. The crew were at the station’s Open day when the pagers alerted them to a person entering the water off Splash Point, Rhyl. Both boats launched to the tasking and made best speed to the area. On arriving at the location, the local coastguards informed them that the person was now ashore and in the hands of the police. Both units returned to station at 1510 to continue the Open day. 17/8/2016. The start of a very busy day for the ILB, beach lifeguards, police and local coastguard teams, with an offshore breeze and an ebbing tide. The calls started at 1325. …………………..1607. 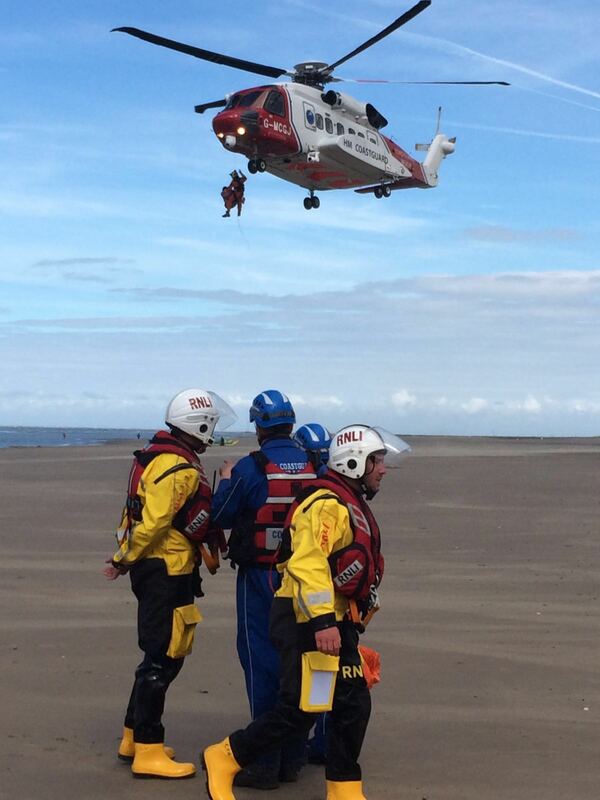 The units were tasked to a 2 year-old child missing off Rhyl beach. As the ILB just started searching, it was reported the child was found safe, and the ILB returned to station at 1615. 16/8/2016.1645. 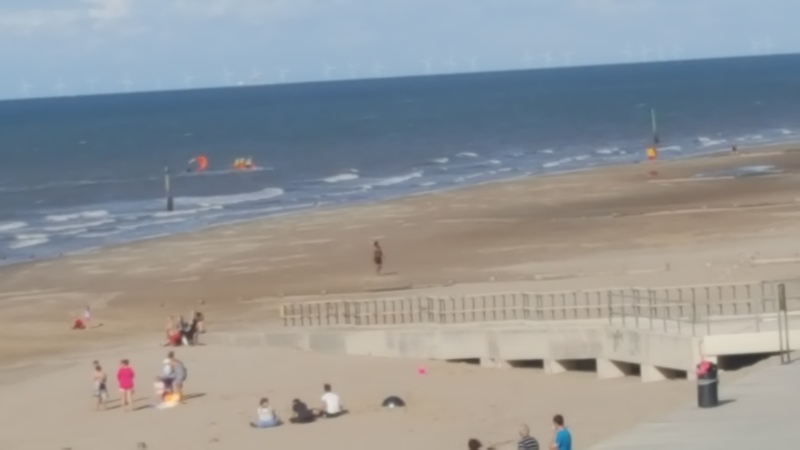 The ILB, RNLI lifeguards and coastguards were alerted to a missing child last seen by the water off Prestatyn. Police also joined the search until it was reported the child had returned home safe and well. The ILB returned to station at 1720. 15/8/2016. 1212. The ILB crew were paged to an inflatable with 2 persons on board off Abergele, blowing out to sea. The coastguard team was also alerted. Just as the crew were about to launch, Holyhead Coastguard reported all were safe ashore, the ILB being stood down at 1222. ………………….1523. The ILB crew were paged again to search for a missing girl last seen in the water off the Skytower. The girl had Downs Syndrome so an urgent search was undertaken by both ILB , RNLI lifeguards and coastguards along the whole promenade. It was the ILB crew who spotted the girl paddling at Splash Point, over half a mile from where she went into the water. The coastguards and lifeguards were called over and the girl and her family were reunited safe and well. The ILB returned to station at 1612. 14/8/2016. 1743. The ILB crew were paged to 3 people in a day boat about a mile off the harbour entrance, with engine problems. The vessel was taken in tow back to the harbour, returning to station at 1840. ………………….1930. The ILB was paged again after a report from near the Westminster Hotel on the promenade, saying an inflatable was going put to sea by the Sea Life centre. Holyhead Coastguard sent out a MAYDAY call but with no reply. The ILB was launched to search the area together with the local coastguard team. Nothing was found. It was suspected this call was malicious, so the units were stood down at 2035. 13/8/2016. 1422. The ILB crew were paged to two people stuck on a sandbank off ASDA Kinmel Bay, with a rising incoming tide. The crew arrived on scene together with Rhyl coastguard team arriving later. The crew attended the couple, giving casualty care, and a rescue coastguard helicopter was diverted from a nearby incident as one of the couple was unwell. The casualty was lifted into the helicopter, and the other person waded ashore, assisted by the lifeboat crew and coastguards. The helicopter landed nearby, and then took both casualties to hospital. The lifeboat crew and coastguards then returned to station at 1510. (2nd photo by Andrew Keenan). 12/8/2016. 1625. Both boats were launched to a report of a stationary inflatable dinghy off Pensarn sewer outfall buoy with possibly a person alongside. The ILB was on scene first and found the dinghy apparently anchored to the sea bed. the anchor line was being recovered but snapped when the line became taut. 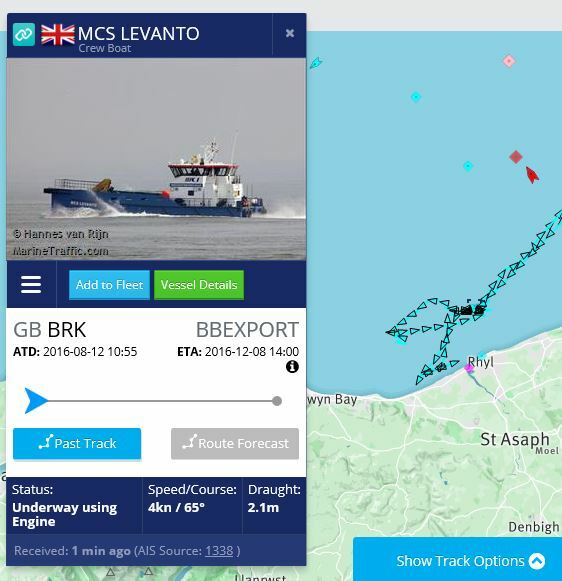 The two lifeboats consulted with Holyhead Coastguard, and a search was undertaken up to a mile out, together with guard vessel MCS Levanto. 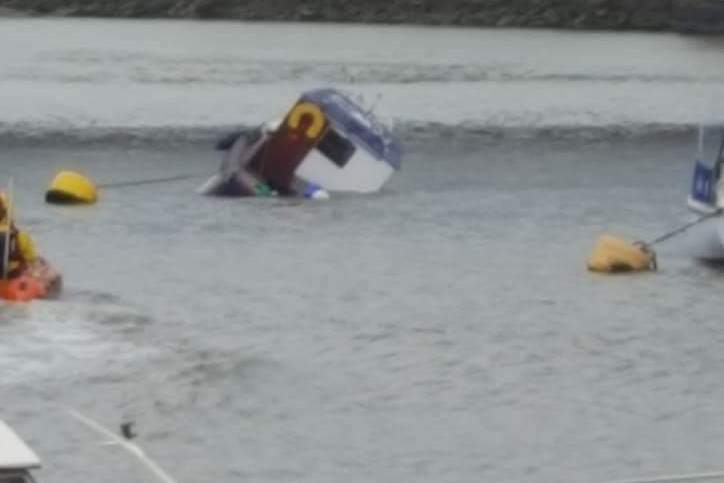 Nothing was found, including shore enquiries by Rhyl local coastguards, except that some people on shore had noticed the dinghy some four hours earlier in the same location, just over an abandoned sewer pipe. The dinghy was recovered and a search undertaken, but nothing was found. The coastguards then terminated the search as no person was reported missing. 6/8/2016.1525. The ILB was launched to reports of an inflatable being blown out to sea on the offshore breeze and ebb tide off Sandy Cove, Kinmel Bay. On reaching the inflatable about a mile out, there was no-one on board, so a search was undertaken back upwind together with Rhyl coastguard mobile team. After a while, the coastguards were informed by a caravan owner who had seen the inflatable being blown off the beach with no-one on board. The search was terminated, the ILB returning to station at 1610. 24/7/2016. 1621. 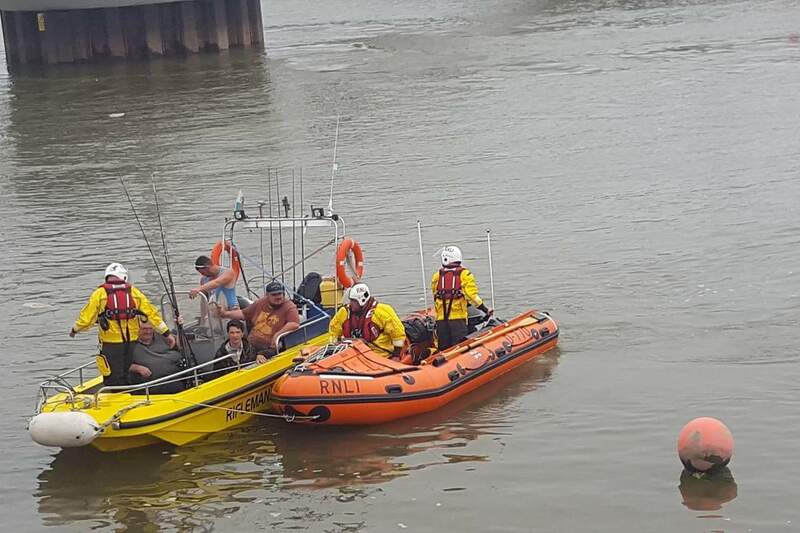 As both boats were returning from a very successful Rhyl RNLI harbour raft race day ( Link to press release ), Holyhead coastguard reported a man going into the sea at Towyn to retrieve his dog. Both boats made best speed to the area, and on scene, it was reported that the man had just made his way out of the water and had left the beach. As all was now well, the lifeboats returned to station at 1645. 4/7/2016. 1532. The ILB crew were paged after a local charter fishing boat radioed Holyhead Coastguard that he had a sick person on board. The charter boat could not get into Rhyl harbour due to the low tide, and so the volunteer crew launched the inshore lifeboat. Both vessels rendezvoused about a mile out from the boathouse, and the casualty and another family member were transferred to the lifeboat and returned to shore at 1618. On shore, other family members had arrived to take the casualties back to their holiday camp. 25/6/2016. 1806 The ILB crew were paged to assist Rhyl coastguards return a small dolphin or porpoise which had been stranded on the beach at ASDA Kinmel Bay. The coastguards arrived initially and contacted the first informant. The ILB arrived on scene a few minutes later. A search was conducted for the mammal but there was no sign of it. The ILB crew questioned a nearby kite surfer, who confirmed the mammal had been returned successfully beyond the surf line by some people on the beach. The ILB was stood down and returned to station at 1845. At 7.20 some crew still at the boathouse spotted a porpoise on the beach off Sunnyvale camp, Kinmel Bay, and the local coastguards were re-tasked to find it. No further RNLI involvement was required and the crew left the station at 7.41pm. 23/6/2016.1543. The AWB had been requested to launch by Holyhead Coastguard to a broken down 25 foot boat just off Raynes Jetty, Llanddulas. 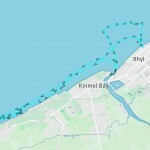 Once the lifeboat was on scene, a tow line was secured to tow the vessel back to Rhyl Harbour. Due to the ebbing tide and water becoming shallow in the harbour, the ILB was requested to launch to take over the tow to the slipway in Rhyl. The three persons on board were met with local coastguard officers and the Rhyl Harbourmaster to safely recover the boat. Both boats returned to station at 1630. Link to press release. ………………..1855. Holyhead Coastguard requested the ILB launch to a person in distress on a surfboard to the east of Victoria Pier, Colwyn Bay. As the ILB was five minutes from being on scene Holyhead Coastguard confirmed the casualty had made it safely ashore and had been met by Rhyl Coastguard to confirm all was well and no further assistance was required. As this was the case and everyone was safe and well the ILB returned to station. 17/6/2016. 2227. The ILB was requested to launch to assist police and coastguards with an incident at the blue road bridge in Rhyl harbour. As the crew were assembling, the coastguard reported the incident was resolved and the ILB was stood down at 2235. Classed as a standby. 7/6/2016.0553. Crew called to reports of red flare off Rhyl harbour, about 1 mile out. On launching, came up on small dayboat drifting, and man in water about 150m west of the boat. The man was picked up and taken back to the boathouse, and handed over to ambulance personnel. The ILB crew then re-launched and managed to put a temporary anchor on the boat to stop it drifting until there was enough water in the river to take the boat back to the harbour at 0810. 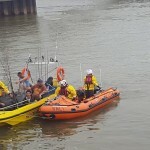 ………………….1015 The ILB launched to pick up the boat and took it back into the harbour, returning at 1120. 5/6/2016. 1408 to 1615 Between 2pm and 4.15pm on Sunday 5 June, Rhyl RNLI volunteer lifeboat crew, lifeguards, and Coastguards dealt with many incidents on the shoreline between Rhyl and Llandulas. The first call came to launch both the lifeboats to reports of a woman swimming out to a child, being blown out to sea off Llandulas, initially reported as approximately a mile off shore. The inshore boat arrived on scene and located the woman, who had successfully managed to get the child nearly to shore. The crew checked all was safe just as the all-weather lifeboat arrived on scene. As all was well, the lifeboats started to return to Rhyl, when Holyhead Coastguard reported the lifeguards at Rhyl were going to the aid of a man swimming out to sea off the west end of Rhyl beach. 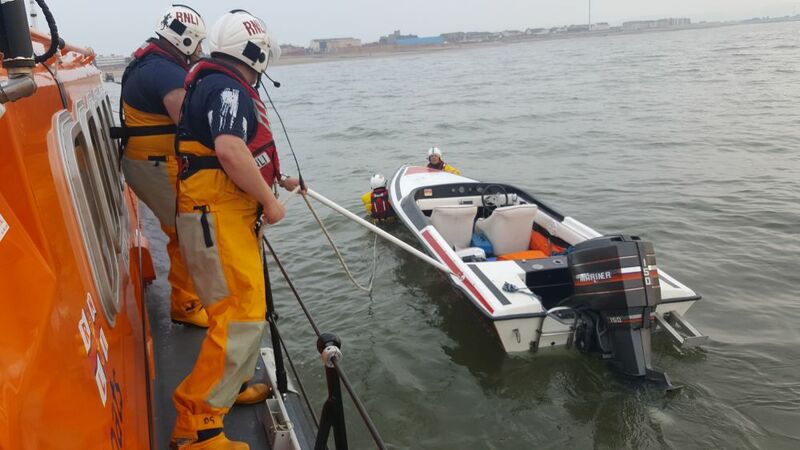 As the inshore lifeboat arrived, the man was clinging to the lifeguard’s paddle board, and they were both taken in to the lifeboat to return to shore safely. The gentleman was given some safety advice when back on shore by the local coastguard teams. Both the lifeboats were then recovering at Rhyl, when it was reported that there were two children from separate families missing at the water’s edge, and so the boats remained on the shore on standby. Luckily the children were spotted on the beach and reunited with their families. The incidents were completed by 4.15pm. 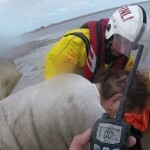 ……………………….. 1937 The ILB crew were paged to assist Rhyl coastguard team rescue a dog which was paddling out to sea off Golden Sands holiday camp, Towyn. As the crew were assembling, the coastguards on scene reported the dog had made it’s own way back safe and well. The ILB was therefore stood down. Classed as a standby. 3/6/2016. 1238 The ILB was launched and the AWB put on standby for a cabin cruiser with 2 people on board, which had run aground on the rocks at the entrance to the harbour. The boat was high and dry when the ILB arrived, and 1 person was transferred ashore, with 1 person holding back to check on the boat. He also eventually left the boat at low water. There was nowhere to secure the boat, so it was decided for the lifeboats to return just as the tide floated the boat later on, as the boat would float into the windfarm shipping channel when it floated free. The ILB returned to station at 1335. ……………. 1830. Both boats re-launched to stand by the vessel as there was no-one on board as it floated. The ILB put 2 crew on board the boat, and stood by tied to the vessel until it floated, holding it against the tide. 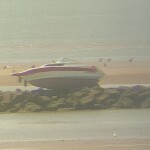 The tow was transferred to the AWB and the boat was towed to the pontoons in Rhyl harbour. The lifeboats returned to station at 2045. 30/5/2016. 1505 ILB crew paged for immediate launch to two children stuck on rocks at Sandy Cove, near Pensarn. The ILB had just launched when Holyhead coastguard reported the children had been recovered safe ashore and the ILB was stood down, returning at 1512. …………………1600 The ILB crew were paged again to assist Rhyl RNLI beach lifeguards search for a missing child off the boathouse at Rhyl. The search had been going on for about ten minutes when it was reported to the boathouse that the child had been found safe and well near the water, but on the shore, and all units were stood down at 1615. 29/5/2016. 1446. The ILB crew were tasked after a member of the public came to the boathouse to report that there were two children on the rock armouring marking the entrance to the harbour, about 200 metres from the shore. The tide was coming in rapidly, and their route back was becoming cut off. Holyhead coastguard operations centre was informed, and the ILB launched, with Rhyl coastguard mobile tasked to the harbour area. The 2 children were taken on board the ILB and returned to their parents. The coastguards then offered sea safety advice to the family. The ILB returned to station at 1512. 28/5/20165. 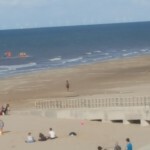 1526 A member of the public reported to the RNLI lifeguards at Rhyl, that they could see an inflatable being blown out to sea near Rhyl harbour on the Kinmel Bay side, away from the lifeguarded area. The coastguards and ILB were tasked to investigate. On scene, the ILB found an empty inflatable. Further investigations by Rhyl coastguard team located the owners safe and well on the beach. The ILB then returned to station with the dinghy at 1542. 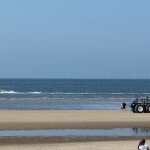 …………………..1725 The crew was paged at 1725 to assist Rhyl coastguards trying to refloat an 18-foot speedboat which had gone aground at Talacre, about five miles east of the boathouse. There were two adults, one child and a dog on board. The ILB arrived first to assist local Rhyl coastguards already on site. The AWB was also launched, should a stronger pull be required to get the boat back in to deeper water. 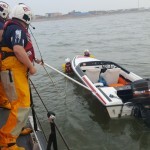 Two long lines were tied together to get a long tow from the casualty to the inshore boat, so there was sufficient water under the lifeboat to start the pull. 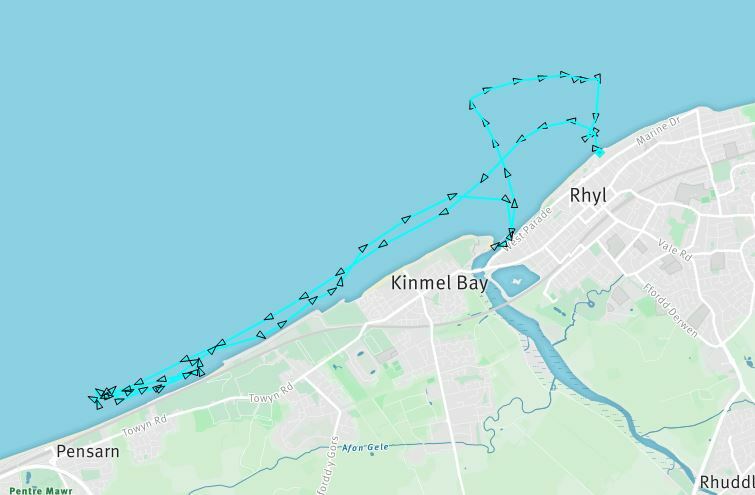 With the coastguard volunteers pushing, and the ILB pulling, the vessel was successfully returned to deeper water, where the All-weather lifeboat took over the tow back to Rhyl, from where the vessel had been launched. 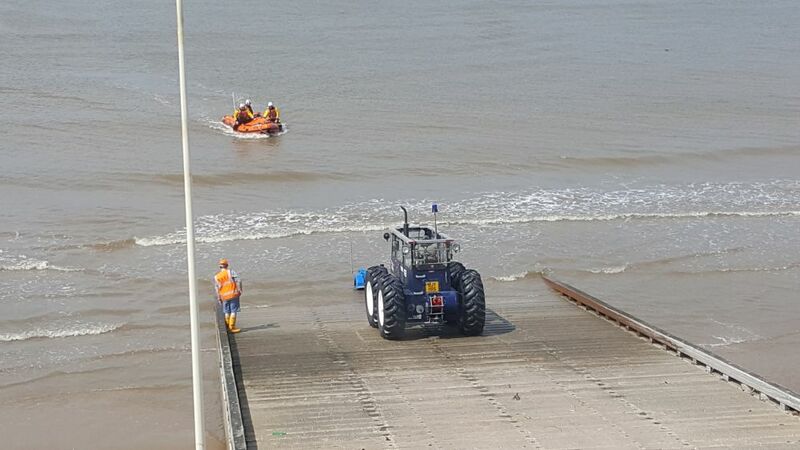 The occupants of the craft were returned by road to Rhyl in the coastguard vehicle, and the casualty vessel was returned to it’s launching trailer on the beach at the lifeboat station. 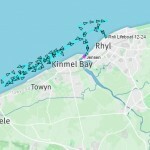 Had the vessel not been refloated, it could have drifted into the busy Mostyn channel and been a hazard to shipping, and would have meant the lifeboat re-launching at 3 am the next morning. The lifeboats were back at station at 2025. .
22/5/2016. 1015 The ILB crew were exercising in the harbour when they were informed of a small private fishing boat, which was sinking on it’s moorings and it was uncertain whether the owner was aboard. A nearby RIB and the ILB went to the boat, and the crew decided to ask for the salvage pump from the station AWB. This was brought by road but the crew were unable to get the pump to the boat in time. 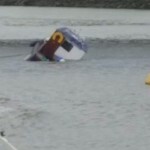 It had sunk on it’s moorings, and the owner was confirmed safe ashore. Once the ILB crew decided they were mo longer required, they returned to their exercise at 1045. Photo copyright and courtesy of Callum Robinson, Rhyl crew. 8/5/2016. 1245 The coastguards at Rhyl had been tasked to assist with the owners of 20 vehicles that had been swamped by the incoming tide at Talacre. As some owners were trying to get to their swamped cars, the coastguards requested police and lifeboat attendance to stand by. 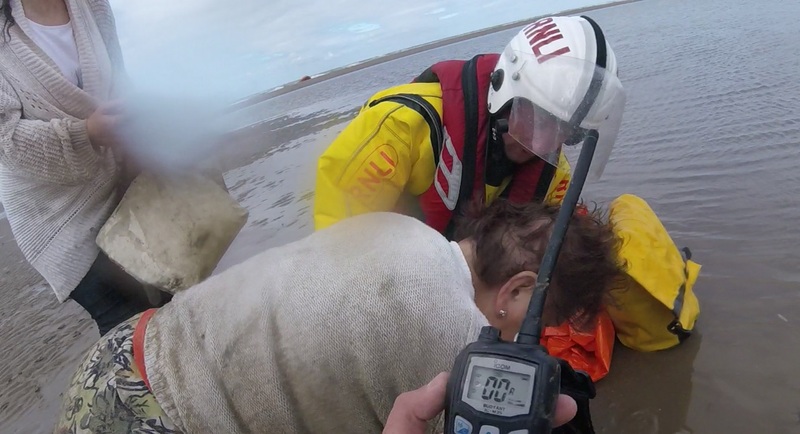 The trip to Talacre was some 15 minutes by sea, and the ILB crew stood by until all was safe and the tide started receding. Once the coastguards reported no people in danger, the ILB was stood down, returning to station at 1405. ILB returning to station from 1st shout. 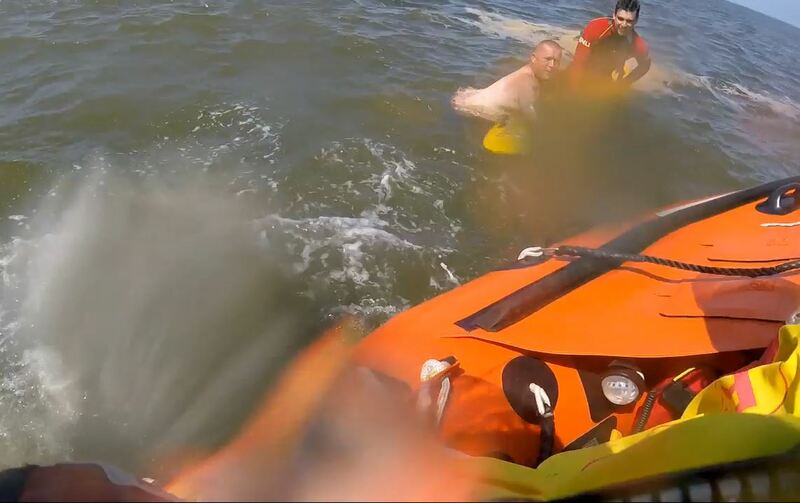 ………………..1454 The ILB was diverted by the coxswain at the boathouse to a small inflatable with 1 adult and 3 children on board, struggling to get back to shore with the ebbing tide and offshore breeze. The ILB was on scene within 4 minutes and assisted the dinghy and occupants to shore, returning to station at 1503. 7/5/2016. 1454 Rhyl coastguards had been paged to attend to a male with a leg wound off the coastguard station next to the boathouse. It was found out that a small child had been in the sea and was discovered in difficulty. The male had gone into the water to rescue the child but had sustained the injury in doing so. Coastguards asked if crew from the boathouse alongside could assist with pain relief and this was given to the casualty. On arrival of an ambulance, the casualty and child were checked over and taken to hospital, the crew returning to station at 1600. Classed as a shore-based service. 6/5/2016. 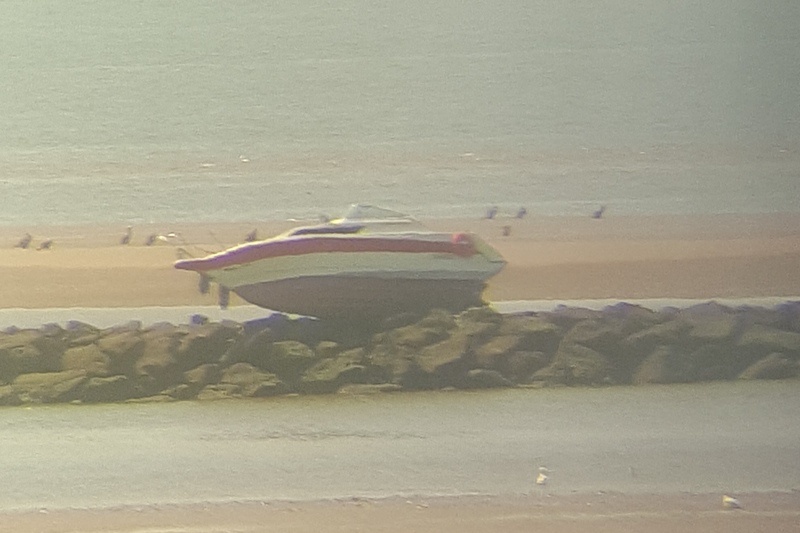 1232 A speedboat with two people on board had recently launched from Rhyl harbour, but had experienced engine problems at sea, about half a mile from the end perch marking the entrance to the harbour. The occupants contacted Rhyl harbour master to ask for assistance back into Rhyl. As there were no boats nearby to tow the vessel, the coastguard were contacted and the ILB crew were paged. The ILB was launched within five minutes and was alongside the casualty some seven minutes later. The occupants of the speedboat had deployed the anchor on their vessel to stop it drifting. This was raised, and the lifeboat crew then towed the vessel back to the slipway at Rhyl harbour. The vessel and it’s occupants were handed over to the harbour master, and the lifeboat crew returned to station at 1305. 11/4/2016. 0045 The crew were paged after North Wales police requested the assistance of coastguards and RNLI lifeboats, to help in their search for a man after his car was found abandoned near the Festival Gardens at Ffrith beach, Prestatyn. The police helicopter was also alerted to provide an airborne search. The coastguards were tasked to search the shoreline, with the lifeboat crews searching just off shore. The inshore lifeboat was asked to search the shoreline, with the all-weather lifeboat providing back-up and illumination. The search had been in progress for about 20 minutes when the police told Holyhead coastguard that the man had been found near the beach by them, and was now safe. All units were stood down, the lifeboats being recovered at 0200. 22/2/2016. 1925. Both boats were launched to reports of a flashing light about 300 metres out from the beach by ASDA Kinmel Bay. The Rhyl coastguard team were also alerted. On arriving in the area, the informant reported the boats were very near to the light, and the only object in the area the crews could see was the fairway buoy marking the approach into Rhyl harbour. The lifeboats went alongside the buoy and the informant confirmed that this was the light they had seen. The wind was Northerly gusting up to force 7 with fairly large waves, and so the buoy may have been hidden by the waves from shore at certain periods. As all was well and there was nothing else in the area, all units were stood down, the lifeboats returning to station at 9pm. 19/1/2016. 0002 ILB launched, and AWB put on standby, after North Wales police received a report of a despondent person threatening self harm , on the beach at Splash Point, the eastern end of Rhyl promenade. Coastguards from Rhyl also paged. Whilst the ILB and coastguards were searching the shoreline, the police checked addresses frequented by the casualty, and found them at one of them. All units were stood down, the ILB returning to station at 0040.